A selection of of local products. An indoor/outdoor market with arts & crafts and plenty of family entertainment. Accessories, stationery, clothing, homewares and jewellry. As with many small communities, this monthly market provides an opportunity for the locals to get together and for visitors to sample some of the local produce and wares. Boutique Markets is a unique shopping experience featuring a handpicked selection of the best in local craft, design, food and fashion. It is located in one of Brisbane’s premier riverfront shopping precincts and runs bi-monthly on the second and fourth Sunday of each month. Independent emerging artists, crafters and designers. A destination for everything hand made. This market is primarily provided for visitors arriving on cruise liners but locals and other visitors are welcome. The market has tourism items, local produce and gifts such as jewelry, leather goods and souvenirs. 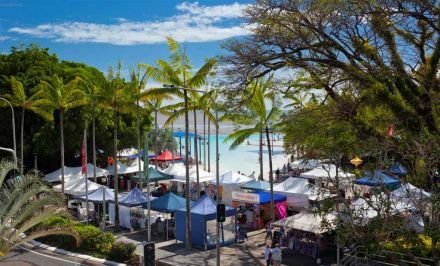 The Esplanade Market is held on the Cairns waterfront and features locally made products including pottery, clothing leatherwork and skincare. White Hat recommends this market for a leisurely Saturday getaway where you can also take advantage of a swim in the lagoon, and cook lunch on the free barbecues while the kids are in the playground. With over 70 stalls and a range of food court options, the Cairns Night Markets are a major tourist shopping hub in Cairns. The market is under cover and operates every day of the year. A large outdoor market selling new and second hand goods. Casual stallholders welcome. A large market on a dedicated site with over 500 stalls featuring clothing, trinkets, gifts, accessories, produce. White Hat suggests you will find it a far cry from the glitz of the nearby casino or the sophistication of the upmarket hotels, but if you can't find a bargain here, you're ot trying. Located close to the Botanic Gardens, this is an all weather market. White Hat suggests that on any particular month you are likely to find an eclectic range of books, quirky antiques, random bric-a-brac, b, clothing, examples of local craft work and some snacks for nourishement. White Hat recommends a visit to this relaxed market situated in the wonderful surrounds of a shady park next to the Endeavour River. Mix with a colouful mix of locals and enjoy fresh local produce as well as locally made handicrafts and random bric-a-brac. An arts and craft market also featuring stalls selling seasonal fresh fruit and vegetables. Sensationally Fresh Produce, Farm Fresh eggs, Plants, Fresh Italian Bread & Cakes, Home Baked Goodies, Arts 'N Craft. Come for Breakfast or Brunch. Relax and enjoy the live Musical Entertainment. 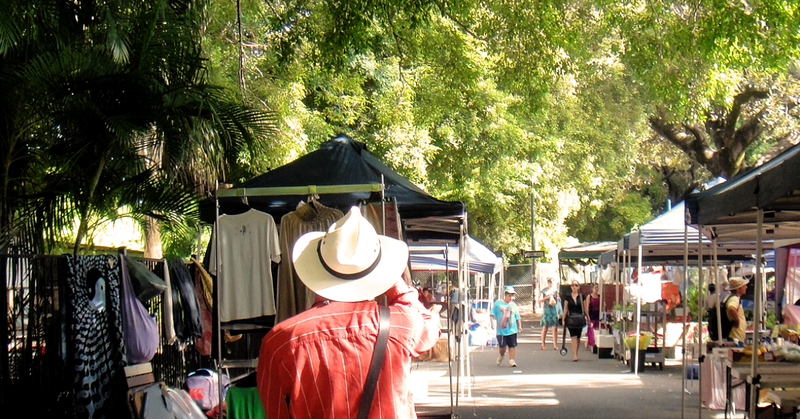 White Hat can recommend Forrest Beach Markets as a very pleasant market under the trees in a beach setting. The market fresh local produce, local arts and crafts, bric-a-brac, family activities and the opportunity for a barbecue lunch. Fresh fruit, vegetables, coffee, cheeses, olives, wines, seafood, herbs, seedlings, plants, wind chimes, organic lamb, wholesale butcher, jams and preserves, pickles, woodwork, unique crafts, jewellery, bowan therapy, buskers and so much more. Experience true market atmoshere, smells and taste real food....gourmet foodies heaven. A market showcasing arts and crafts and held under the trees in the delightful setting of horseshoe bay. There is live music from 11am and local shops offer market day specials. Ask bus and ferry operators about special market day fares. White Hat has been to many farmers markets in Australia but this has to be one of the best in a city centre. Workers can come straight out of their corporate offices and have no excuse for not knowing where their food comes from and to buy a healthy batch of fruit, vegetables and other goodies to take home. White Hat can particularly recommend the avocado, mushroom and salsa meal from one of the mushroom stands. Full details at Jan Power's Farmers Markets. Seasonal crops and fresh food related products sold by farmers, growers, makers, producers, bakers, butchers, fishermen, flowers, plants, artisans and a few boutique arty & crafty homely creatives from Queensland, Northern Rivers area and the Wild West. Full details at Jan Power's Farmers Markets. A colourful bustling market selling fresh farm produce flowers breads artisan products meat fish poultry plants organics and food related objects. For those who are purist about framers' markets needing to be operated solely by farmers selling their produce then this may not be for you. However White Hat can recommend it as a combination of framers' market and mainstream market, and in the end if you are serious about the origins of the produce you buy you can always talk to the stallholders (which you still need to do at the 'holier-than thou farmers' markets anyway). There are plenty of exotic products, special promotions, entertaining events and chefs give cooking classes. Known by a number of names - Kuranda Original Markets, Original Kuranda Rainforest Market, etc - Kuranda is definitely a market town, and the markets are definitely aimed at tourists. If this is your cup of tea, White Hat suggests you allow yourself a few hours to take in what is on offer. White Hat recommends that the Lucinda Markets are well worth a detour off the highway. With over 30 stalls in a seaside atmosphere and Hinchinbrook Island in the background there are plenty of relaxing things to see and do in Lucinda. It also offers wonderful opportunities for photographs, including the engineering achievement of the large Lucinda jetty. The Malanda Markets offer fresh local produce, local crafts and a range of other goods. It is managed by the local Lions Club which White Hat usually finds is a good indicator of a community-oriented event. A relaxed market held in a pleasant pak by the water. Nobody is in a hurry in Manly on a Sunday. Browse around to see what the local creative types Have on offer. Drive or boat your way to the Marina Boardwalk Markets held every Saturday. As well as the usual fare you would expect at a good market - freshly grown produce, freshly harvested seafood, condiments and sauces, local artwork and second hand clothing - you will also find all manner of boating wares for sale including full boats. White Hat can particularly recommend this as a great place for boaties to stock up on goodies for their day on the water. White Hat finds this to be a particularly well-chosen location for a market featuring hand made local art and craft. The location is in front of the nearly 50 metre long mosaic created by local artists and celebrating the history of the district -particularly the sugar cane industry. Take the time to observe the hidden details of the mosaic and the fine details of the craft works for sale. The Mission Beach Markets offer a wide range of goods and are held under the trees on the scenic beachfront. It is always worth a visit to Mission Beach and the market offers a good excuse. White Hat reminds you that the beach markets are different from the Monster Markets Mission Beach which are also organised by Rotary. The Monster Markets Mission Beach ia held in pleasant parkland with a range of stalls and has an emphasis on family-friendly activities. White Hat reminds you that the Monster Market is different from the beach markets which are held on the first and third Sunday of each month throughout the year which are also organised by Rotary. 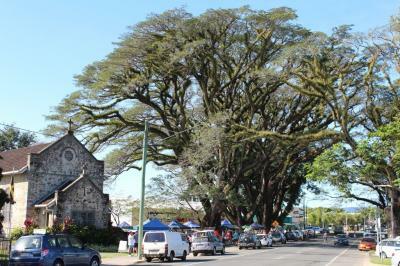 Located under the huge raintrees near historic St David’s Church, this market offers fresh local produce and local crafts. White Hat suggests that visitors may choose to combine a visit to the market with a swim in the nearby Mossman Gorge. A large range of local produce from local farmers and producers. Fruit, vegetables, seafood, jams, chutneys, and all the seasonal produce that this part of Queensalnd has to offer. In addition to the foos the is a range of other handmade goods. White Hat recommends that if you are taking a holiday in Noosa you make sure to get to this market to stock up for the week. A certified organic farmers market. Fresh produce for sale as well as demonstrations of permaculture and creating an edible landscape. Adjoining the farmers market you can find artists and others with craftwork and a variety of other goods for sale. White Hat Can particularly recommend the freshly made bruschetta. An indoor market featuring local talent and local busineses. There are homewares, arts & crafts, gifts and more. It is opposite the railway station and plenty of free parking is available. Come along and enjoy a relaxing Saturday evening. 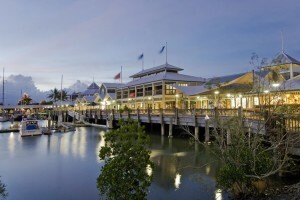 This large waterfront market is about half an hour's drive from Cairns and White Hat suggests it is well worth the trip if you want to experience a busy community market in a tropical atmosphere. There are local handmade goods including jewelry, clothing, pottery, plants, food and skincare products together with family entertainment. This picturesque market has the mountains and the Coral Sea as a backdrop offers local fresh produce and hand crafted goods. White Hat advises that his market is officially a ‘Cotters Market’, thereby ensuring that goods offered for sale are made by the stallholder. Boutique Markets feature a handpicked selection of the best in local craft, design, food and fashion. It is located in one of Brisbane’s premier riverfront shopping precincts. If you find yourself just north of Townsville on the third Sunday of the month, White Hat suggests you might like to have a lazy picnic in the Rotary Park and wander around the Raintree Markets. It is also a great park for the kids to have a run and play. The market is set under an impressive group of raintrees and features fresh local produce, bric-a-brac, snacks, coffee, tropical plants and local craft. A market featuring arts, crafts, produce, preserves and more. Breakfast and morning tea are availabale at the Rollingstone Historical Society Muesum. A small community market featuring local produce and other goods. A bustling produce market that also offers a variety clothing, jewellery and bric-a-brac. Anyone inteersted in tropical fruits and vegetables is likely to be delighted with this market and White Hat particularly suggests you search out the PNG stalls and talk to the stallholders about how they use the food they have on offer. The Saturday Fresh Market at Rocklea is a great place to start the weekend. A whole range of fruit and vegetables as well as breads, meats and deli items. Find a comfortable cafe area, order a breakfast, get out your iPad or Tablet and read the weekend papers from around the world while feeling very much in Brisbane. A wide range of articles for sale include produce, bric-a-brac, hand made items and plants. White Hat recommends that you keep an eye out for gemstones where the astute buyer may pick up a real bargain. Arts, craft, fashion, jewellery, home wares, regional produce and more. The South Bank Young Designers Market has provided exposure and a career start to a number of young Queensland designers as well proviing cutting edge fashion to both serious fashion buffs and casual shoppers. It features distinctive, affordable garments, accessories, jewellery and prints all in in the wonderful setting of the South Bnk parklands. A diverse range of entertainment and a huge variety of food, fashion, craft, jewellery and home & leisure displays. This waterfront market has a backdrop of palm trees and luxury yachts which White Hat suggests may offer a clue to the products on sale. Handmade jewelry, clothing and souvenirs are well to the fore. If you want to continue into the evening, there are plenty of quality restaurants nearby overlooking the water. Showcasing , the markets are a relaxing way to spend a Sunday morning. This market lines Tanks promenade on Collins Avenue, with live entertainment provided by local musicians. Stalls feature a blend of local art, craft, produce, vintage clothing, collectibles and local natural health products. White Hat suggests this venue as a pleasant way to spend a Sunday morning. You may then want to wander on to relax in the nearby Botanic Gardens. New Ownership (Previously Marina Mirage Farmers' Markets.) (07)3103 2325 (this G.C. Skype number incurs normal call costs.) info@thefarmersmarkets.com.au. A premier lifestyle market on the Gold Coast. Fresh produce, gourmet foods & specialties. Parking – turn left into park just before Mariner’s Cove. A farmers market with a range of fresh produce. A Brisbane institution and a great way to relax with plenty of cafes, bars and to choose from. White Hat suggests you check out the cheap eats while you are there. The market features emerging fashion designers, jewellery, accessories as well as massage, clairvoyants and the range of activities you would associate with such a bohemian area. A market with a range of bric-a-brac and second hand goods together with clothes and produce. Licensed bar, food & live entertainment. A large market with plenty of fresh prduce, much of it from surrounding farms. The market also has second hand clothing, gourmet foods, bric-a-brac, flowers and performers with a strong bohemian and community feel. The Yungaburra Markets is the main fundraiser for the Yungaburra State School Parents and Citizens Association and is a pleasant hour and a half's drive from Cairns. There are plenty of stalls to choose from and you can find full information at Yungaburra Markets. White Hat can particularly recommend the Christmas Market on the third Sunday in December.